You may simply watch the maps below and try to figure out what they mean. If you want to understand how they were generated, please read the Concept and Methodology sections. As described there, the first steps consist in extracting massive amount of information from Google and analyzing it in terms of semantics and homophony. From this complex and time-consuming procedure we get some geometrical description of language, considered here as the hypergraph of words and pages that is stored in Google's database. The first thing to understand is that each pixel of the map corresponds to one couple of words - and not to one word. This looks quite non-intuitive but remember we are mainly interested in correlations between words. We started from a lexicon of several thousands of words which correspond to about 800 000 couples (as many pixels then), and we looked for homophonic correlations, as in billard / pillard, or for semantic correlations. Homophony between two words tells how much both words look like each other. In our context it is measured thanks to so-called Damerau-Levenshtein distance, a standard procedure in information theory. The Google Similarity distance reflects the semantic relatedness of both words. This distance is smaller when both words are closely related, ie. when they tend to appear more often in the same webpages. It tells how much a word has a univocal meaning or at the contrary is polysemic or equivocal. In the case of a graph it is related to the clustering coefficient. Technically we take the minimum of this coefficient for a given couple of words. We associate homophony with Red, Google Similarity with Green (but in inverse relationship) and Equivocation with Blue (in inverse relationship). Each pixel has a colour defined by its (Red,Green,Blue) components, therefore each couple of words is associated with a (R,G,B) triplet. This self-organizing map is generated with a neural network that gathers together pixels of similar (R,G,B) (more explanation here). 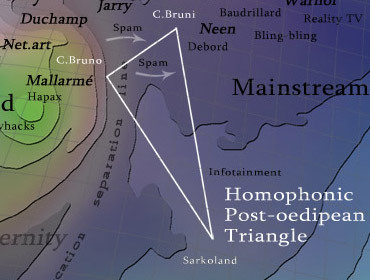 Homophony - High homophony region. Wasteland - Low relatedness: couples of words that are barely used in the same contexts and have very few in common. A zone from where new significations and surprises emerge (friche or jachère in french). Mainstream - High relatedness: words are strongly correlated to each others and everything is very predictable. Utilitarianism - Low equivocation: each word has a univocal meaning and there is no place for ambiguity. At the end of the Mainstream region lies the kingdom of Boredom. Finding precise boundaries for these different zones is for the moment an impossible task. We just don't know how to define scales, separating what is big from what is small. The Equivocation Separation Line that delimits the high equivocation zone from the low equivocation zone is not therefore very precisely located and it is not our aim to claim that we have localized it with accuracy. A region of particular interest is the one with high homophony, high relatedness and high equivocation. This is what we called the Dada region and it was the starting point of our study. It is the red region at the top left of the map. If this zone is big, then mankind is very Roussellian or Dada. Of course Dada is not limited to this region and goes beyond the range of this map. Since we are not able yet to find out the precise borders between the different zones, it is difficult to define precisely what would be the value of a such a global index as the Dadameter, wich is somehow supposed to measure the size of the Dada region. We probably need to make some arbitrary normalization, but the study of the dynamics would be important here since the variations with time of such indexes would certainly tell us a lot. We leave these questions for further developments. Also you shouldn't be mistaken by the fact that two region's names are very close on the map. It just mean that they share some characteristics (the three we have defined in this study), but not all of them of course. As for the stars in the sky, they may sometimes look close and in the same constellation but are very far away in reality. However, the light rays that come out from them do travel on close paths. We can now superimpose two other types of entities: first, media phenomenon and second, artists and artistic movements. Among media phenomenon you will find Hapax or Googlewhacks. They are somewhere in the region where relatedness is at its lowest. A hapax is a word that appear once and only once in literature (most famous one is by Stéphane Mallarmé). A Googlewhack is a couple of words that appears in only one page of the web, as it is reported by Google. Spam streams are marketing linguistic flux from Wasteland to Mainstream. They are also related to Homophony: spambots cheat on anti-spam filters by using words like Viaa.gr*a instead of Viagra. Spam streams are not a region, they belong to the dynamical aspect of the problem for which there is no quantitative analysis yet. These questions might be taken into account in future studies, but because of the difficulty to obtain all these information, the analysis of their evolution in time is a very difficult task. 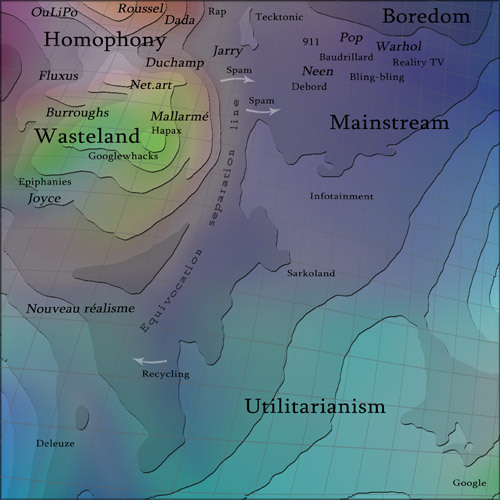 On the left of Wasteland, the Epiphanies as defined by James Joyce. They are a way to destroy the totalization of meanings and lie not far from the left limit of the map where signification breaks down. This zone out of Signification, decay of the Imaginary, is situated outside of the map. Jacques Lacan had made a correlation between the collapse of Joyce's narcissism ie. the decay of the Imaginary, and the role that the epiphanies play in his work. Outside of the map above Dada we have situated the decay of the Symbolic, following this article by Jean-Claude Maleval which relates this vanishing point of enunciation to the episodes of mental crisis in the life of Roussel where he felt having the glory ("avoir la gloire"). As Joyce's writing would be, according to Lacan, an attempt to make up the decaying Imaginary, Roussel's work, according to Maleval, shows an attempt to artificially restore the Symbolic through a mechanisation of language. Here we assume that this inflation of the Imaginary dimension in Roussel's work is actually a premonition of Pop, to be opposed to the vanishing narcissism of Joyce. It is interesting to relate this with the idea that Pop Art is an answer to Walter Benjamin's decay of the aura, following Baudrillard's comment in De la marchandise absolue. It is also quite understandable that this Pop region does not lie very far the kingdom of Boredom, one of Warhol's favorite words. On the other hand the positionning of Pop doesn't really reflect its essential irony, in relation to the fetichism of commodity. We reach here the limits of such a cartographic representation. In between those two decays, semantic capitalism and Taylorisation of speech stretch away. Modernity may be here identified with Utilitarianism and a bit of Mainstream (but not Boredom), but in principle it also contains some of the Avant-Gardes on the top-left... although I would personnaly consider some of them more as percursors of Postmodernity. 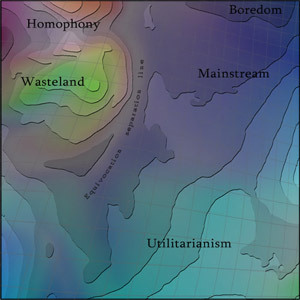 The Spam streams from the Wasteland region towards the Mainstream and Utilitarianism regions, are of particular interest. This mechanism might be compared to the processes of the very origins of capitalism, namely the rise of agrarian capitalism around Renaissance. Wasteland is used as a Temporary Autonomous Zone for renewing Capitalism always threaten by Boredom and extinction of desire.